An integral first important step in this targeted therapeutic research initiative is to build an integrated comprehensive database that would ‘house’ the genetic tumor information for subsequent comparative analysis. It is now technically and financially feasible to generate extensive genome-wide data sets on individual human subjects, including extensive clinical and laboratory data, 500k SNP chips for CGH and genetic association studies, mRNA expression and splicing arrays, quantitative proteomic profiling, and re-sequencing data. Essential to collaborative molecular pediatric cancer research is the development of an integrated database structure that is “standardized” both in data input, data fields, and data integration. Such databases would put more focus on quality control and standard operating procedures, with an effort to provide consistency in data structures that would enable more powerful data analysis tools. It is believed by experts in the field that the development of an integrated database would more quickly and more accurately achieve the molecular tissues analysis necessary to move this essential drug development forward. To begin collaborations on this necessary research initiative, ACCO initiated a 2 day work shop funded by the American Cancer Society and the National Cancer Institute in May 2004. We subsequently hosted a workshop of interested childhood cancer organizations at the World Cancer Congress held in July 2006. This led to collaborations with St. Baldrick’s Foundation and Children’s National Medical Center to study the existing molecular database structures worldwide. The study showed that caBIG, and especially caIntegrator were the most mature of those databases analyzed currently available for integrating clinical data, mRNA profiling, CGH, and resequencing data. The caBIG resource, while primarily developed at the NCI, and also initially hosted there, was built to be purposefully ‘de-centralized,’ with ‘adopters’ at different centers nationally. The caBIG resource was also providing support to NCI-funded pediatric cancer initiatives (leukemias, and more recently Dr. Maris’ TARGET neuroblastoma project). 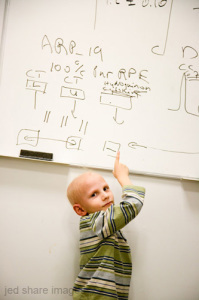 To support multiple pediatric cancer projects using caIntegrator, one or more external, non-NCI (University or biotech) adopters of caIntegrator (and other caBIG resources) should be developed for pediatric cancers. To move ACCO into the research realm, we were proud to be recipients of the funding raised through the gala ‘Naomi’s Hope for a Cure’ (www.hope4acure.net). All proceeds from this gala event were donated to Candlelighters for our Targeted Therapies Research Initiative. To encourage further research focused on improving translational medicine information systems,the American Childhood Cancer Organization, in collaboration with St. Baldricks Foundation (www.stbaldricks.org) and Alex’s Lemonade Foundation (www.alexslemonade.org) hosted a workshop in May 2009, which brought together key leaders in the field of cancer informatics from research, professional, and government sectors. The workshop dedicated two days to individual and panel presentations to identify and prioritize key challenges with the goal of building on the NCI TARGET initiative. In the “omics” era, clinical research relies heavily on database-supported bioinformatics. Integrating our knowledge about disease phenotypes and finding preventive and treatment interventions are central to how we approach informatics in support of large-scale studies with high-dimensional datasets such as those generated by high throughput genomics and proteomics platforms. Under the broad theme of “informatics in support of translational research in childhood cancers,” in this workshop, those attending explored research challenges and cutting-edge solutions for handling translational medicine data from the point of origin (i.e., data collection) to its presentation and manipulation using user-friendly data portals. Workshop participants explored a wide spectrum of health data from childhood cancer studies ranging from–genomics and cellular level, to the patients’ level and ultimately to the population level. With more than 25 leading scientists attending the workshop, there was a super-majority consensus that the creation of an integrated molecular database would move the science along faster, hence potentially bringing new treatments to patients faster. These scientists are committed to utilizing the database with their personal research data. The American Childhood Cancer Organization, continues to take the lead in this research initiative and continues to raise funds nationally as well as through the ACCO affiliate research fundraising efforts. Through the development of targeted therapeutic drugs, children with cancer world-wide can be given hope for a cure, and hope for long term survival that lessens the life-threatening late effects of current toxic treatment. Your restricted donation to this important research goal will help bring much-needed new treatments.